My Grandma’s awesome, mouthwatering recipes! It’s the same with every visit to my grandmother’s place; you’ll be greeted by exquisite aromas of Bengal. The flavours of Bengal’s finest spices always linger in the air inside her house and they tingle your taste buds right away. You’ll feel yourself floating towards the kitchen, following that aroma and go in for a dive. I have been fortunate enough to taste those delicacies cooked by her. The reason her cooking is so very special is because she loves to cook and she loves to cook for us. You’ll never see her tired when ever she’s in her kitchen. To the contrary, you’ll find her all flushed and excited and looking forward to prepare a new dish! Every dish is a luxury. Her exquisite cooking; perfectly seasoned and with the flavours seeping in to the core make every bite magical. Although all of the dishes cooked by her are a favourite, there are 3 that I specifically picked up for this post. I also took my aunt’s advice and picked up a note book to jot down all of her recipes for amazing cuisines, snacks, pickles and drinks so that her wonderful legacy is carefully passed on. I am going to provide my sister and my cousin a copy of the same so that they can hone their skills and find calm and happiness through food like I do, specifically so because of the warm connection I have with my grandma. 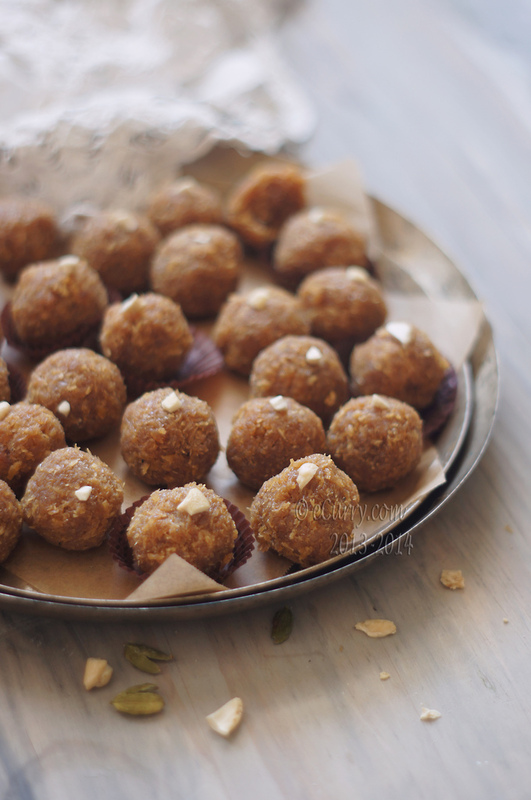 Being a sea-food lover, here are some notes on my grandma’s recipes for my favourite dishes and a sweet treat of a dessert as well. 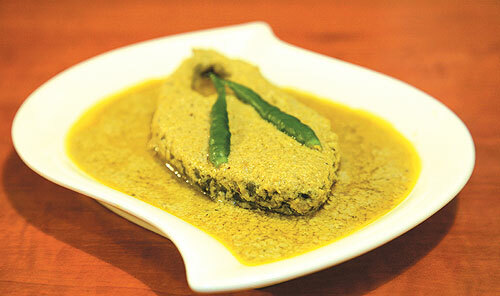 On top of the list is my ever so favourite, Hilsa steamed with coconut and mustard. It’s a delicacy from Bengal and it is loved by many here. It is very hard to keep me away from my grandma’s Hilsa preparation. Sheer perfection is the only way to describe it. The fish is sliced out delicately and marinated with salt and turmeric, and then coated with layers of ground mustard seeds paste, coconut paste, mustard oil and chillies from her garden. They are then steamed in a pressure cooker or a steamer. It’s that simple and easy. Some times, the slices are wrapped up in coconut leaves while steaming and this infuses a delicate earthy aroma while the fish is steamed perfectly. This takes around 10 minutes and then the room is filled with the aroma of perfectly cooked Hilsa which make the elephants stomp in my stomach! You can taste the spice mix right down to the last bite. It’s an absolutely incredible out-of-the-world experience and I love it! 2. Prawn in curd with cheese! 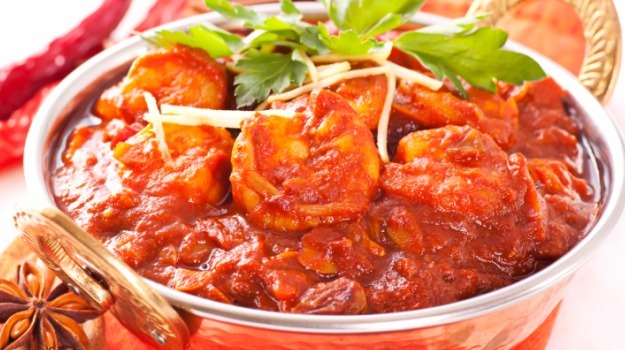 Next on the list is a Prawn dish which she had cooked for my birthday. For this, the prawns are cleaned up and marinated with salt. They are then fried for a few minutes in sunflower oil and fenugreek. Then onion slices, onion juice, chillies and a lot of fresh curd and and coriander is added to the lightly fried prawns and is then cooked for a few minutes in all its entirety. To finish off, garnish with some grated cheese and serve. It was love at first sight for me and the taste was sensational! I asked her to cook this for me so many times and she did! The coconut is scraped, the flesh is mixed with powdered or thickened milk, and sugar and jaggery is added in to the mix. Everything is simmered and cooked for some time. After taking it down from the heat, the sticky confectionery is cooled and then rolled up in small balls. My grandmother has to make a huge batch of these as it just disappears within minutes. Its sticky , gooey and so tasty! Everybody pops them in their mouth like popcorn. It’s absolutely impossible to let anything go to waste when it comes to my grandma’s cooking. Please note: I couldn’t provide the actual pictures so I’ve put representational pictures. Sources: 1, 2, 3. Next Post: The Spontaneous Traveller: When Plans No Longer Matter!